You’re caught in the competency trap. You’re really good at your job. You’ve mastered your craft at the mid-point in your career. You enjoy your work and you’re recognized and rewarded for being your organization’s resident expert. You spend more and more of your time doing what you do best and less and less time learning new skills. This won’t seem like a trap until your boss drops hints that your best is no longer good enough. You’re told to be less operational and more strategic. You’re challenged to step up and take on a greater leadership role. So how exactly do you step up? You could lock yourself in your office and think deep, strategic thoughts. You could load up on the latest leadership development books and podcasts. You could hire a coach who promises to connect you with your inner leader and you could register for conferences and courses that reveal the secrets of how great leaders think. Or you could heed Herminia Ibarra’s advice. 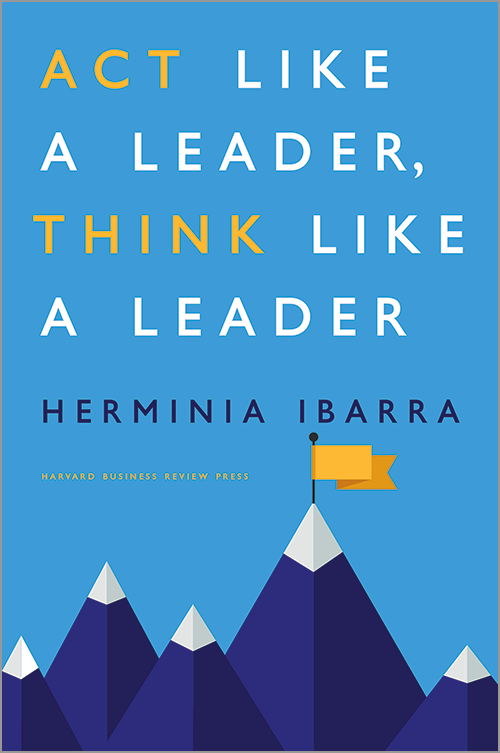 Ibarra is author of Act Like a Leader, Think Like a Leader and the founding director of a leadership transition executive education program at INSEAD, one of the world’s largest graduate business schools with campuses in Europe, Asia and the Middle East. Ibarra’s not sold on the idea. She believes that if you want to become a leader, start doing leadership work. That work will then change how you think. You don’t need more insight. What you need is outsight, says Ibarra. So how do you do build outsight at work? Find new ways of doing your job. Make new connections beyond your existing networks. And start connecting and engaging with people in new ways. Adopt a big-picture perspective of your organization. Start scouting for emerging trends within and beyond your industry. Sign up for cross-functional projects and contribute beyond your area of expertise. Bring people and resources together to work on worthwhile goals. Reallocate your time by deciding what to less of, more of and what new work to take on. Build some slack into your schedule for non-routine and unexpected opportunities. Grow your networks to include people who don’t do the same work as you or share your view of the world. Ibarra says most of us are lazy and narcissistic when it comes to networking. “We get to know and like people who are easy to get to know and like because we bump into them with minimal effort. This is a must-read if you’ve hit the mid-point in your career and you find yourself caught in the competency trap and coasting on autopilot. Don’t wait to be told that you need to step up your game. Save the self-reflection and introspection for later. Start acting like a leader now.